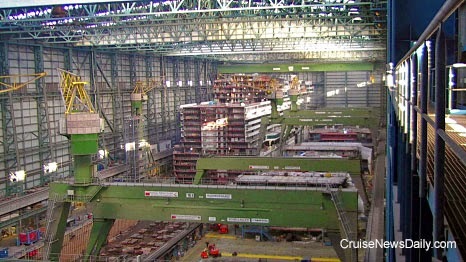 As has become their custom, when Meyer Werft floats out a ship, a few days afterward, they give us a behind the scenes look at the operation. Anthem of the Seas floated out last weekend, and Meyer is showing it to us from their unique perspective. Video courtesy of Meyer Werft. All rights reserved. May not be copied or used without permission. P&O Cruises said this morning that HM Queen Elizabeth will name Britannia at the Ocean Terminal in Southampton on March 10. Details to follow in the February 27 edition of Cruise News Daily. This week, on two successive days, Princess Cruises released details of their 2016 programs in Europe and Alaska. Aside from the program information itself, in the whole scheme of things, there was actually a major sign of the times very evident that was never mentioned. Where the ships are should serve as some foreshadowing to established markets. 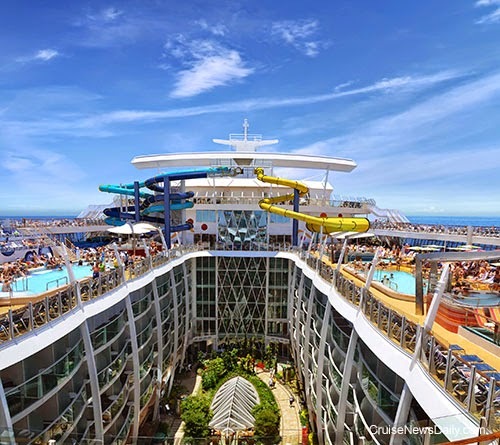 Royal Caribbean today began to release information about their third Oasis-class ship, Harmony of the Seas. From what they said so far, it seems that the biggest news about it is where it will be deployed. Even though the press release promised “new thrills and adventures,” so far we’re seeing only one big new feature. The rest of the ship, however, is updated with Royal Caribbean’s current features and versions of their current specialty restaurants. 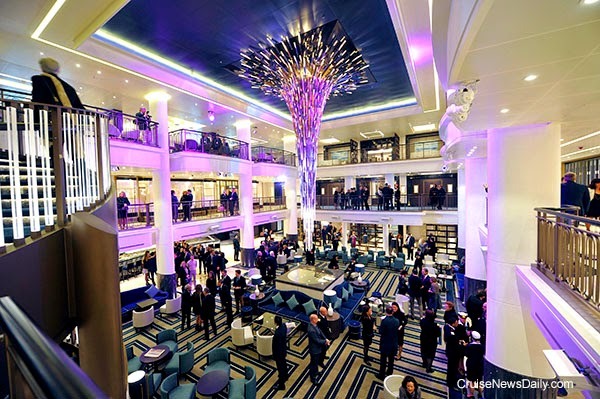 Details appeared in the February 25 edition of Cruise News Daily. 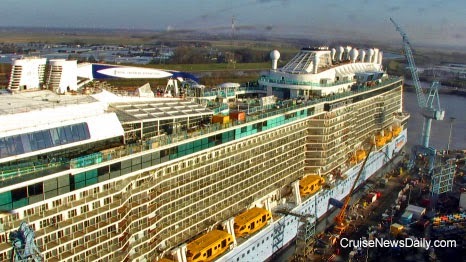 Harmony of the Seas is the third Oasis-class ship and will debut in April 2016. The one big new feature is the multi-story waterslides. 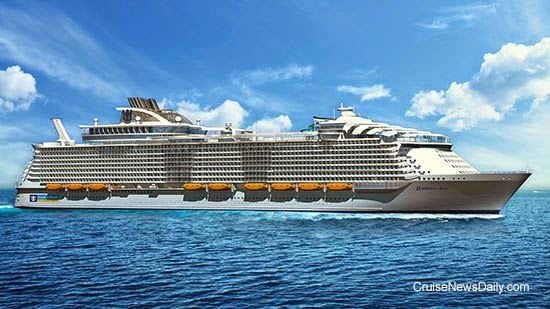 Renderings courtesy of Royal Caribbean International. All rights reserved. May not be copied or used without permission. Meyer Werft showed us an updated view today of Anthem of the Seas which floated out on Saturday night. The webcam view confirmed that on Sunday the ship's funnel was attached as was the arm for the Northstar observation platform. Anthem of the Seas at Meyer's finishing dock today. Meanwhile a few meters away, inside Meyer's covered building dock, it looks rather empty. But probably not for long. At the end you can see the two sections of Norwegian Escape, and construction will be starting soon on Ovation of the Seas. Norwegian Escape has room to expand now that Anthem of the Seas is outside. Viking River Cruises will be cruising US rivers in the not-too-distant future, and they’ve chosen New Orleans as their first home port. From there they will cruise up the Mississippi beginning in late 2017. Details appeared in the February 24 edition of Cruise News Daily. P&O Cruises took delivery of Britannia Sunday in Trieste with an official flag-changing ceremony aboard the ship when it was handed over from Fincantieri. The ship is a sister in some respected to Princess’ Royal and Regal Princess, in that it was built on the same hull design, but inside, it is its own ship. It’s nothing like the Princess ships, as can be seen in the photo of the unique atrium below.